Jerad assists individuals with landlord and tenant matters, probate, will and trust matters as well as personal injury representation, student loan and IRS matters and contract disputes. He has successfully litigated and negotiated settlements concerning employment disputes, insurance contracts, personal injury matters and oil and gas lease and pipeline issues. Jerad believes there is a solution to every problem and that proper planning and focused legal counsel are essential tools for achieving personal and business success for his clients. Jerad was born and raised in Northeast Ohio and graduated from Green High School. 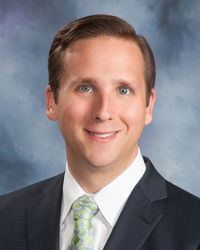 He currently lives in Stow with his wife Amber Zibritosky, the elected Law Director for the City of Stow, and their young children Grayson and Sienna. Jerad is an active community leader involved with several non-profits and charitable organizations.